BODYWORKSMD Removes the hurdles to rehabbing your knee. Too busy to go to physical therapy? BodyWorksMD brings the therapy to you. Rehab your knee anywhere you can watch a DVD. All you need is 25 minutes, 3-4 times a week. This is the convenient way to guide yourself to a stronger and more flexible knee. Use this DVD to rehab a wide range of common knee ailments, including: meniscal injuries, ligament injuries, overuse injuries, running injuries, tendonitis and arthritis. The BodyWorksMD program can be customized to your injury and level of comfort. Begin with the self-assessment section to determine your level of therapy. Learn the specific exercises in the techniques section. As your knee gets better, the program allows you to progress to higher levels of stretching and exercise. BodyWorksMD guides you through many of the same routines by physical therapists. This series was developed by board certified orthopedic surgeons, Dr. Mark Klion and Dr. James Cappozzi of the Manhattan Orthopedic & Sports Medicine Group in collaboration with certified physical therapist, Paul Larosa. Dr. Mark J. Klion leads each section. He serves as the Medical Director for the New York City Triathlon and is an accomplished Ironman Triathlete. BodyWorksMD also includes a bonus section of knee anatomy and the treatment of common knee injuries featuring former pro-triathlete and top international coach, Troy Jacobson. BodyWorksMD incorporates the discipline and testing techniques of sports medicine with a format that is flexible and achievable. This is physical therapy you can do. And BodyWorksMD will be there to help you through it with the encouraging words of Dr. Klion and a music track that makes the process more enjoyable. So what are you waiting for? Get to work with BodyWorksMD! All you need is 25 minutes, 3-4 times a week. 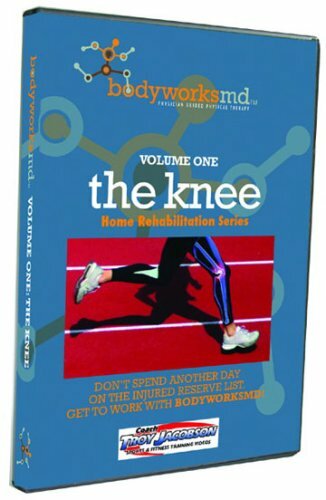 Use this DVD to rehab a wide range of common knee ailments, including: meniscal injuries, ligament injuries, overuse injuries, running injuries, tendonitis and arthritis. As your knee gets better, the program allows you to progress to higher levels of stretching and exercise. BodyWorksMD guides you through many of the same routines by physical therapists.